Summer Hagen as Julia. Photo by Aaron Fenster. 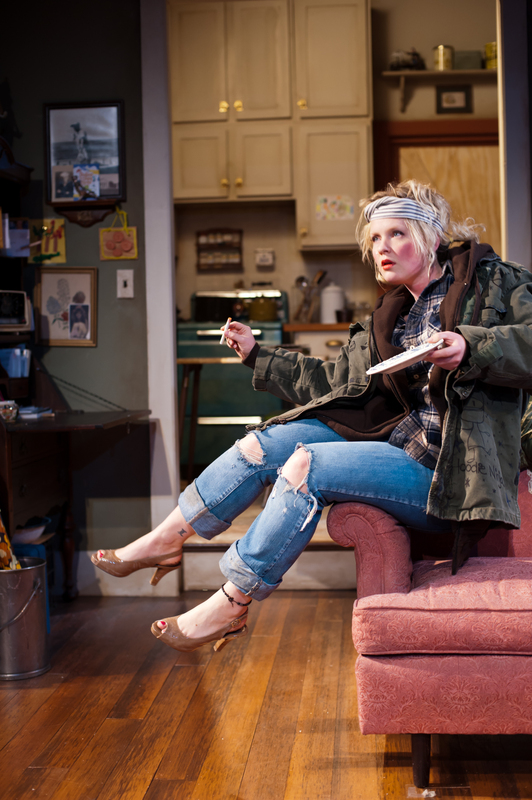 Although Conor McPherson’s The Birds shares a title with Alfred Hitchcock’s 1963 film, this new play, currently in its American premiere at the Guthrie Theater’s Dowling Studio, is not a stage adaptation of the film. The two works do share the same source material; both take Daphne du Maurier’s 1952 short story of a mysterious attack of birds as their premise. But the film and play differ in setting, tone, plot, and character. For his part, McPherson sets this terrifying story in an abandoned New England house where two strangers have taken refuge together, hoping to survive despite the unrelenting avian attacks. Like the two strangers, Nat (J.C. Cutler) and Diane (Angela Timberman), one feels trapped in the house that serves as both a prison and a sanctuary. Wilson Chin’s set design captures the aesthetic of a well-lived in and much-loved house that’s been abandoned in a hurry. Countless details contribute to this look, from gently used laundry baskets to bookshelves cluttered with trinkets and papers. But this aesthetic alone would not have been enough to make me feel as if I too were under siege. It’s the set’s spatial orientation that makes this sensation possible, because it imposes on the audience’s space and pulls it the living room. What’s more, this orientation makes it impossible for any one section of the audience to see everything that happens. Having my view partially obscured reinforced the sense that I was in the house, rather than being a detached observer of its inhabitants. The lighting and sound designs heighten the claustrophobic atmosphere that the set makes possible. Matthew Richards’ lighting expertly captures the look and tone of natural light at different times of day. The shifting quality of light not only marks the passage of time but also filters the characters various moods. For his part, Scott W. Edwards eerily creates the noises of the attacking birds. In first moments of the production, the sound of birds rushing toward the house comes from behind the audience toward the stage. Freaky. But it’s not only the mysteriously furious birds that cause horror and create suspense. Like many horror stories, McPherson’s play is as much about the perils of human interaction as it is about an external threat to humanity. What does it take to survive? And what are survival’s costs? These are some of the questions that emerge, especially when a third character, Julia (Summer Hagen), stumbles into the house sometime after Nat and Diane have already established a routine. It quickly becomes clear that three’s a crowd, though much of the play’s anxiety revolves around exactly which one of them is the third wheel. It’s in this ability to sustain an anxious tone that The Birds really excels, rather than in its content. McPherson’s script is well-constructed and nuanced, but it doesn’t ever really get beyond some tried and true hallmarks of horror and science fiction. McPherson does introduce some promising questions about religion and morality into this nature-against-humanity scenario, but unfortunately they remain under-explored yet over-discussed. Still, the play captives because it’s not really what they characters say that effectively communicates their increasing desperation, but how they say it. Tone of voice is just one of the many registers on which Cutler, Hagen, and Timberman create an atmosphere that is both fascinating and frightening. Their glances and gestures also contribute to the play’s anxious feel. It’s a tribute to Henry Wishcamper’s direction that one learns just as much about the group dynamics from watching their silent movements and interactions during scene changes – through which they stay in character – as one does from the scenes themselves. I should note that Stephen Yoakam is excellent as a fourth character who makes a brief appearance at the house. Although the play explores each of the characters’ motivations to some extent, Diane’s perspective takes on a privileged position. She periodically writes in a journal and excerpts of her writing are read as voice-overs. To be sure, these voice-overs help illustrate Diane’s particular situation, as well as advance the plot. And yet, they also work against the production’s strengths, namely its creation of a claustrophobic environment in which possible threats come from the humans inside as well as from the birds outside. It’s the mystery of each character that makes the play compelling. Furthermore, these audible glimpses into Diane’s head works against the sensation that the audience is as trapped as the characters. The production is at its best when their psychological design matches that of its set, which simultaneously imposes on the audience and denies it a clear view of the characters. The Birds by Conor McPherson. Directed by Henry Wishcamper. At the Guthrie Theater, February 29-April 8. 818 South Second St., Minneapolis, MN 55415. February 3-March 11. Guthrie Box Office: 612.377.2224 or 877.44.STAGE. Tickets may be purchased online at www.guthrietheater.org.